A sleepy small-town vibe reigns in Belmont, where strong family ties and tradition prevail over innovation and change. Join us on a visit to the most exciting and delicious neighborhood in the Bronx. The subway train leaves Manhattan and crosses the Harlem river. After stopping at Yankee Stadium, it winds its way towards Tremont Avenue, making its unrelenting, shrieking sound as it goes. Low brownstones bathe in the afternoon sun, colorful murals brighten up dull warehouse exteriors, and reflections dance across the rooftops. It’s an endless patchwork urban landscape, painted in ochres. I get off at Fordham Rd, and wander along this busy main artery in the warm afternoon sun. I turn onto Arthur Avenue, and notice that the bustle of the crowd hasn’t followed me here. It’s as quiet as a back alley in a rural town. 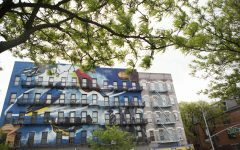 The first thing any visitor sees on Arthur Avenue is a long, colorful mural. Across it, the quote “THE SADDEST THING IN LIFE IS WASTED TALENT” is written in bright yellow letters. A Bronx Tale is a stage play, a movie, and more recently a Broadway musical, which tells the story of a young Italian-American boy growing up in the Bronx of the 60s, where he is torn between different worlds and two opposed role models. The world of his strict, law-abiding father contrasts starkly with that of his other father figure: local mob boss Sonny, who comes to represent a completely different set of morals. 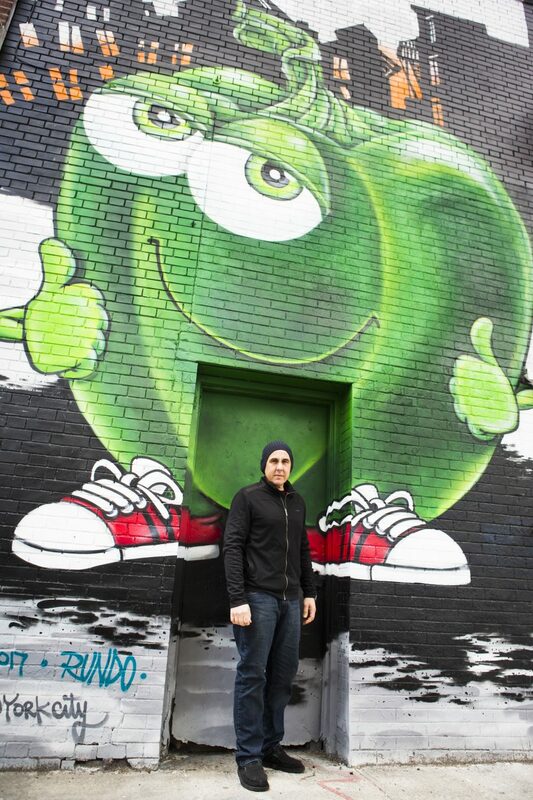 At the wall, I meet up with the artist Mike A. We’ve agreed to meet here so he can show me his enormous mural, which is positioned to direct the viewer’s gaze towards Little Italy and Arthur Avenue. MikeA – not wasting his talent. -I wrote a comic book years ago, it’s in A Bronx Tale kind of style, so there are Mafia pigeons in it. Then you’ve got the tomatoes and peppers, the Arthur Avenue food, the pasta and all that. The white negative space in the back with the red and green over it brings the Italian colors in to it. I wrote a comic book years ago, it’s in A Bronx Tale kind of style, so there are Mafia pigeons in it. Mike A is a pop artist and creative director. 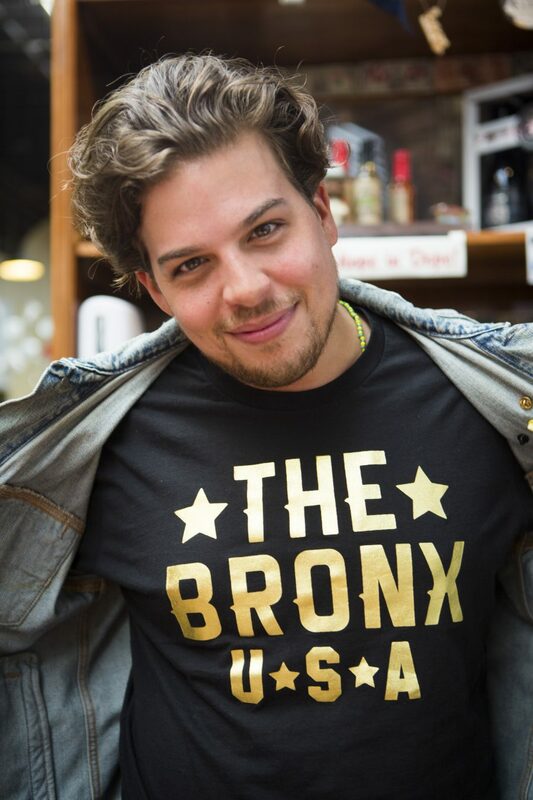 Mike is Italian—and born and raised in the Bronx. 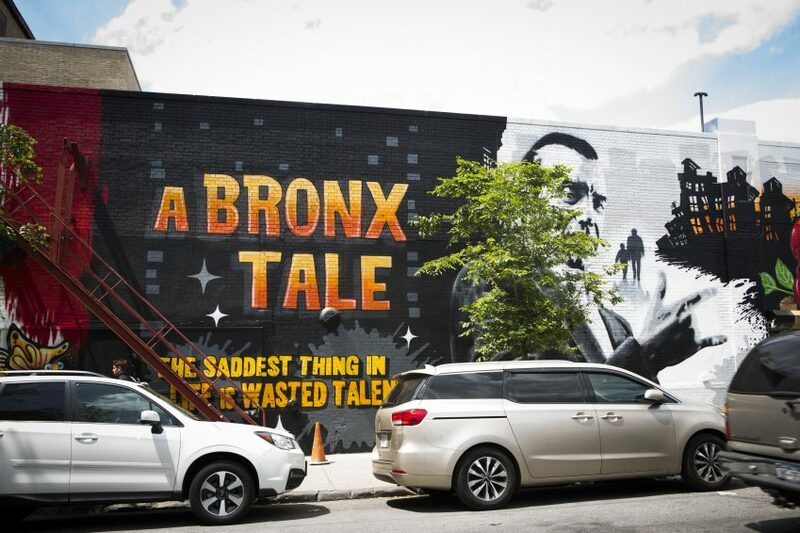 When the Bronx Business District asked him to paint the mural, and he understood that the actor Chazz Palminteri had given the project his blessing, it was an easy decision. Chazz Palminteri based A Bronx Tale on his own experiences growing up in this neighborhood, and produced his one man show in the late 80s, which eventually led Robert De Niro to contact him to ask for his permission to turn the story into a film. De Niro wanted Palminteri to play the part of Sonny in the movie, which premiered in 1993. 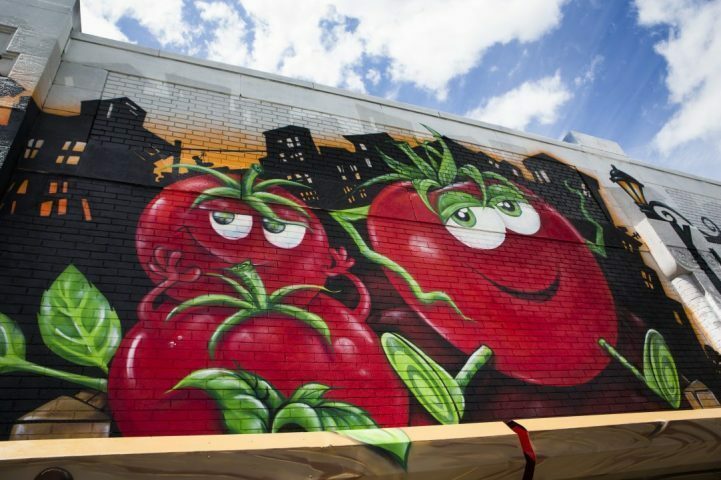 The mural was commissioned to be an uplifting piece, which would express the essence of Arthur Avenue, while also reflecting the story, of course. I’m in a good mood from seeing the painting when I say my goodbyes and walk on down Arthur Avenue. Belmont is a neighborhood of about eight blocks North to South, stretching from Fordham Road to 182nd Street, and nine blocks across from East to West. Belmont is more than just Arthur Avenue and Little Italy. Puerto Ricans, Albanians and Croatians all call this area home, as do a whole load of other nationalities. Belmont and the Bronx is multicultural in a way that other parts of the city only attempt to be. Germans and Irish flocked here in great numbers during the second half of the 19th century, and in the 20s, numerous Italians made their way here in search of a new life. This diversity is perhaps best reflected by the local food culture. 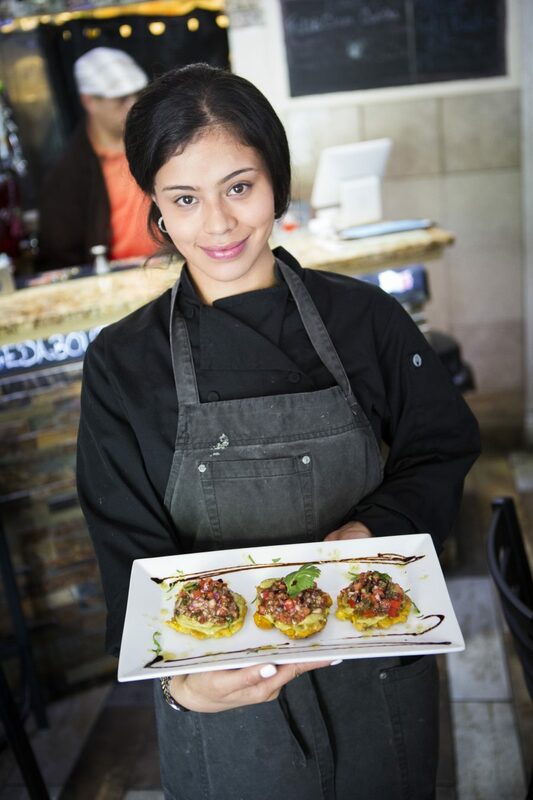 Chef Gabrielle del Gado is half Ecuadorian and half Puerto Rican, and cooks Italian/Spanish fusion cuisine in what has to be the smallest kitchen in New York. Small plates and craft beer. Somehow, she magics up tostones, bruschetta, and whisky wings within the confines of this minimal space. It’s an absolute mystery how her father manages to fit inside there as well. He has to tuck his elbows in and tilt his baseball-capped head to squeeze past his daughter. Gabrielle brings out even more food! Coconut shrimp, octopus, and shrimp ceviche, all made from recipes that her great, great grandmother passed on to her. Local, home-grown, and adhering as closely to family traditions as possible. -Everything is local, from the market across the street. We grow the herbs ourselves, and buy meat from the local butcher. My uncle brews the beer. The old recipes are the most popular ones, so I guess people notice the authenticity, Gabrielle tells us. Gabriell chef on Belmont street. After jotting down the family’s recipe for sangria, I move on. Back outside on Arthur Avenue, I’m tempted to try some incredibly fresh Black Berry Point Oysters from Prince Edward Island. Both sides of this tree-lined artery are packed tight with delis, cafés, pork shops, restaurants, and bakeries. Italian, Albanian, and Spanish voices blend in with English ones. Some cats lazily follow the lilt of everyday life from behind a recessed window. You can find anything you need without ever having to leave Arthur Avenue, and a strong sense of family permeates the whole area. I browse the delicacies on offer at Teitel Brothers, a family business that has existed in this location for more than a century. Regular customers enter, greet the staff absent-mindedly, and pick up their usual orders. Provolone and gorgonzola cheese, soppressata salami and caprocollo ham. Fresh pasta, tomatoes, garlic, and herbs for your tomato sauce. I walk into the Arthur Avenue Retail Market, which is the true heart of Little Italy. Generations of locals have come here to buy sausages, cheese, vegetables, and spices for their dinner tables. Now, a younger generation is also being drawn here thanks to the Bronx Beer Hall, which takes up a significant amount of space at the center of the market. I order a plate of cold cuts, and let the bartender guide me through their selection of craft beers. Grimms Rainbow Dome, a dry hopped sour ale that is brewed with apricot and conditioned on oak, turns out to be the perfect companion. While I enjoy my meal, I discuss the history of Belmont with Paul Ramirez, who owns and runs the Bronx Beer Hall with his brother Anthony. The Bronx Beer Hall is all about the present and the future, but it remains firmly rooted in historic soil. It’s an example of continuity and change in perfect harmony, and of powerful family ties. Once the market starts to wind down for closing time, the music in the beer hall is cranked up, and the seats start to be filled. The market is gradually turned into a rowdy meeting place for students from the nearby Fordham University. But a few of the traders stay open later, and I make a last pass through the space. It is Belmont’s ties to the past that hold it together, and make it unique. Here, restaurants and stores stay in the same families for generations. David Greco at Mike’s Deli offers me to try some of the largest cold cut platters I’ve ever seen, and fifty or so different sandwiches. 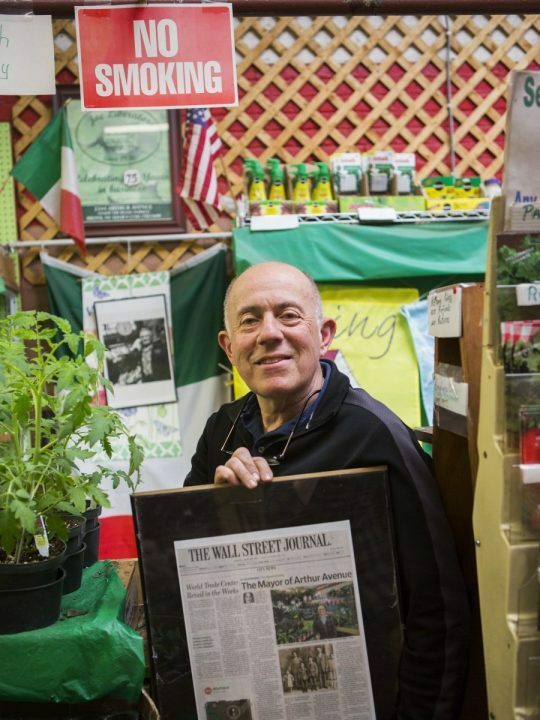 Richard Liberatore second generation plant and seed vendor. Richard Liberato’s market stand is located at stall four, the first one to the left of the entrance to the market, and one of the most desirable ones in the market. 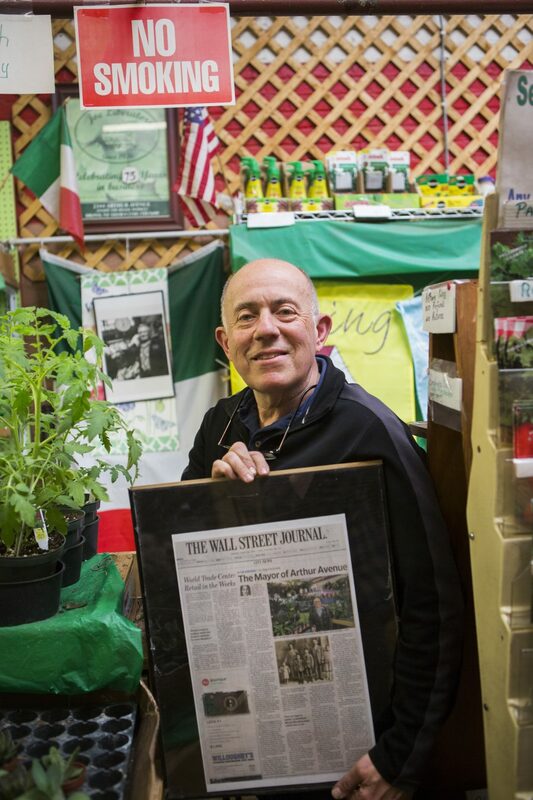 At Liberatore’s garden, Richard sells plants and seeds, just like his family has done ever since the market first opened in 1940. -My father came to the United States in 1936. He was actually born here, but when he was just a year old, the family returned to Italy after the First World War. When he came back at seventeen, his father didn’t know what to do with him. You know, he didn’t speak English and whatever…But somebody was selling their pushcart, right here on Arthur Avenue. He bought it, and he liked it, he liked doing it. When his mother came a couple of years later, she didn’t want to be outside, but he told her: “they’re gonna build an inside place”. And in 1940, mayor Fiorello La Guardia built this market. Ha also built the one underneath the metro north train on 116st street, he built one on Houston, on Essex Street, and one in Brooklyn, too. The whole idea was to make the city more cosmopolitan. At La Guardia’s market, 115 traders were allowed in, and granted seven feet of space each. To fit inside the small spaces, they did what they knew: they built replicas of pushcarts, and stood in the middle with their wares piled up around them. His dad stood there, inside his little stall, until he passed away in 2011, at the age of 92. -The reason why he was given stall number 4 was that he was an American citizen. People couldn’t believe it—he’d only just arrived from Europe, and didn’t speak any English; he didn’t even know where Connecticut is! But he stood here for 75 years. He had a hand in everything that happened in this neighborhood, and within the enormous congregation of Italian-Americans, which numbered 40,000 back then. There wasn’t an association around where he wasn’t on the board. When anybody needed help, he was there for them, Richard tells us, his eyes sparkling at the memory. His little market stand allowed him to raise five kids, and put them all through college. -He was a really good guy, and you could learn a lot from him. He was the real deal. He was the last of the pushcart guys. This is exactly what a crispy crust Italian pizza is supposed to taste like. The cozy vaults and stone walls will convince you that you’ve actually been transported to Italy. Emilia’s home cooking (ravioli and cheesecake!) is the reason why this place is always packed with locals. Crossover tapas, Spanish/Italian and South American. They also brew their own beer. This family owned business, which has a lovely atmosphere, is run by Joe (owner), Regina (daughter), and Michael (son and chef). There are many Italian restaurants up here in Little Italy, and Roberto’s on Crescent Avenue, which is listed in the MICHELIN guide, is one of the best of them. They have an amazing wine cellar, and their wine list reflects this fact. A relaxed, casual lunch, or a more sophisticated dinner—take your pick! Arthur Avenue Retail Market is a beautiful food market right in the heart of Little Italy. Browse the delicacies on offer, buy some to take home—and best of all: sample them before you buy! 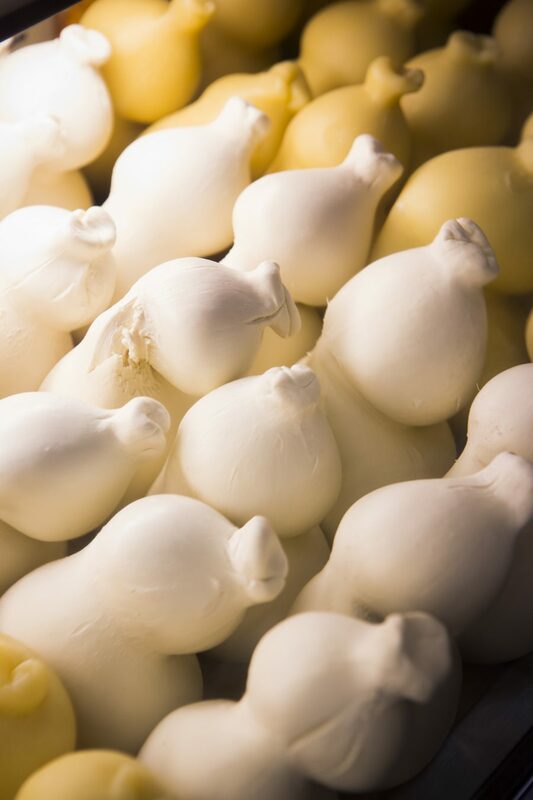 You won’t find this many top-quality Italian products anywhere else. Provolone and gorgonzola cheese, soppressata salami and caprocollo ham. Fresh pasta, tomatoes, garlic, and herbs for your tomato sauce. The best spot in NYC for fresh pasta. You can watch your meal being made while you wait in line. 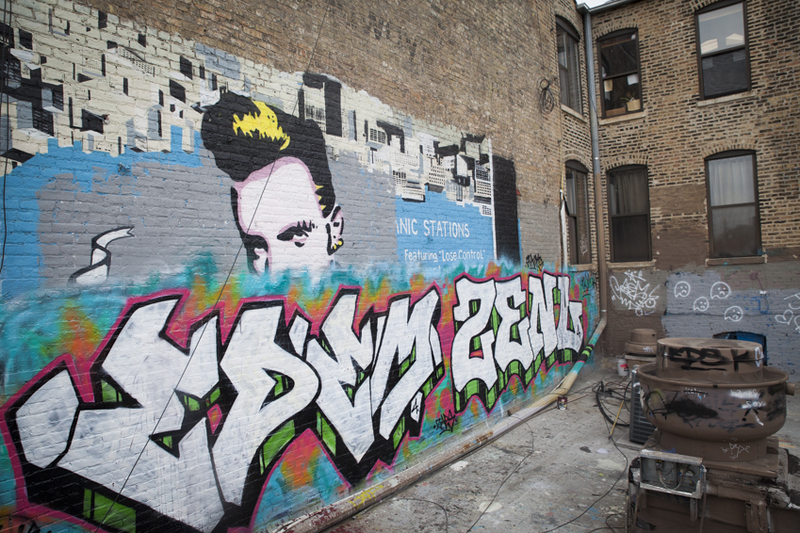 Has served this neighborhood for more than eighty years. The best sausages in all of New York. We’re not kidding. If you can’t find it at the Calabria Pork Store, don’t bother looking for it! Sopressata, Culatello, and loads of other delicacies hang from the ceilings. If you’re going to make your own pesto, this is where you need to do your shopping. They offer an amazing selection of fine olive oils, sausages, herbs, and pasta. Craft beer heaven in the middle of the Arthur Avenue Retail Market. This is a perfect meeting place, where students who live in the area hang out until closing time (yes, the Bronx Beer Hall stays open after the rest of the market has closed). An excellent selection of hard-to-find beers that go beautifully with the huge plates of cold cuts you can get from the Italian delis next door. If you want to stay in the Bronx, you mustn’t miss the Opera House Hotel. It’s a gorgeous Beaux-Arts building, with beautiful rooms and that wonderful atmosphere that you can only find in a historic hotel. Doubles start at ##1,300 kronor, including breakfast. A beautiful church that has been a meeting place for several generations of families. The adorable ornate windows and the unique atmosphere make this an essential visit. 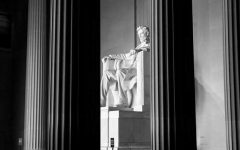 If you want to learn more about Italian-American heritage and history, this is where you need to go. There is always an exciting exhibition on here, and the botanical garden is first-rate. The Bronx Zoo attracts hordes of families every day of the week. 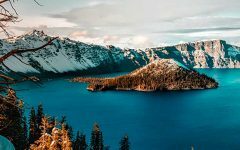 It has lots of animals, of course, but also offers other experiences, like 4D cinema and a few fairground rides, as well as an awesome monorail that takes you for a ride through the wilderness. The sea lions’ and dolphins’ feeding times also attract crowds of spectators. Tunnelbanetåget lämnar Manhattan via Harlem River. Stannar till vid Yankee Stadium, kränger vidare mot Tremont Avenue med sitt skärande envisa ljud. Låga bruna och röda tegelbyggnader badar i eftermiddagssolen, färgglada konstverk lyser upp trötta magasinsbyggnader, solen leker med hustaken. Ett ändlöst urbant lapptäcke målat i ockra. Vid Fordham Rd hoppar jag av. Vandrar i den varma eftermiddagssolen längs den stimmiga artären, viker in på Arthur Avenue och märker att bruset inte följt med mig in hit. Här är lugnt som på en bakgata i en liten lantlig stad. Det första som möter besökaren på Arthur Avenue är en lång färgstark väggmålning. I klargult lyser citatet THE SADDEST THING IN LIFE IS WASTED TALENT. A Bronx Tale är en teaterföreställning, film och numer också musikal på Broadway som handlar om en ung italiensk-amerikansk pojke som växer upp i The Bronx på sextiotalet med olika världar och skilda förebilder. Hans korrekta och laglydiga pappas värld står i bjärt kontrast mot den lokala maffiabossen Sonny som blir en fadersfigur med helt annan moral. Vid väggen möter jag konstnären MikeA. Vi har bestämt träff för att han ska visa mig sin enorma målning som leder blicken rakt in mot Little Italy och Arthur Avenue. – I wrote a comics book years ago, A Bronx Tale kind of style so theres mafia pigeons in there. Then you got the tomatoes and peppers, the Arthur Avenue food, pasta and all that. The white negative space in the back with the red and green brings the whole Italian colours in to it. MikeA är en pop konstnär och creative director. 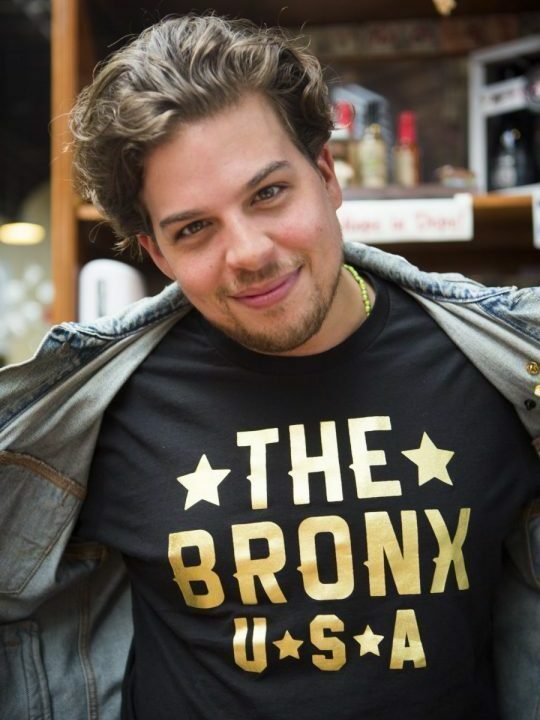 Mike är italienare – och från The Bronx. När han fick en förfrågan från The Bronx Business District om att göra verket och förstod att skådespelaren Chazz Palminteri stödde projektet var det lätt att hoppa på. Chazz Palminteri skapade A Bronx tale baserat på sina upplevelser (han växte upp i kvarteren) och gjorde enmansföreställningen i slutet av 80-talet vilken ledde till att Robert De Niro kontaktade honom och ville göra film av berättelsen. De Niro ville att Palminteri skulle gestalta rollen som Sonny i filmen som hade premiär 1993. Målningen skulle vara upplyftande och sammanfatta Arthur Avenue och spegla berättelsen förstås. Verket gör mig på gott humor när jag säger hej och går vidare längs Arthur Avenue. Stadsdelen Belmont är ungefär åtta kvarter som sträcker sig från 182:a gatan till Fordham Road i norr och nio kvarter från väst till öst. Belmont är inte bara Arthur Avenue och Little Italy. Inte minst puerto ricaner, albaner och kroater kallar de här kvarteren sitt hem, likaså en uppsjö andra nationaliteter. Belmont och The Bronx är mångkulturellt som andra delar av staden bara försöker vara. Hit kom tyskar och irländare i stora skaror under artonhundratalets andra hälft, från 1920-talet hittade mängder av italienare hit och byggde upp sina nya liv. Mångfalden avspeglas inte minst i matkulturen. Kocken Gabrielle del Gado är ecuadorian-puertorican och gör italiensk-spansk fusion mat i vad som måste vara ett av stadens minsta kök. Small plates och craft beer. Tostones, bruschetta och whisky wings trollar hon fram från det minimala utrymmet. Hur pappan också får plats är en gåta, han fäller in armbågarna och lägger det kepsklädda huvudet på sned för att tränga sig förbi dottern. Gabrielle lassar fram mer mat! Coconut shrimp, octopus och shrimp ceviche med recept från hennes great, great grandmother. Närodlat, egenodlat och i linje med familjetraditioner så långt det går. -Allting är lokalt, från den lokala marknaden över gatan, kryddorna odlar vi själva, köttet tar vi från slaktaren i kvarteret. Ölen brygger min farbror. De gamla recepten är de populäraste så people tend to notice the authenticity, berättar Gabrielle. Med receptet till familjens sangriablandning nedskrivet drar jag vidare. Tillbaka ute på Arthur Avenue lockas jag av purfärska Black Berry Point Oysters från Prince Edward Island. På båda sidor om den trädkantade artären ligger delis, cafes, pork shops, restauranger och bagerier tätt, tätt. Italienska, albanska och spanska röster blandas med engelska. Man behöver inte lämna Arthur Avenue för att hitta det man behöver och en stark familjekänsla genomsyrar kvarteren. Jag botaniserar i utbudet av delikatesser hos familjeföretaget Teitel Brothers som funnits just här i över hundra år, stammisar hälsar förstrött och hämtar upp det gamla vanliga. Provolone och gorgonzolaost, sopresatta-skinka och caprocollo-salami. Färsk pasta, tomater, vitlök och kryddor till tomatsåsen. Jag går in på Arthur Avenue Retail Market som är hjärtat i Little Italy. Hit kommer lokalbor som de gjort i generationer för att handla hem korvar, ostar, grönsaker och kryddor till middagsbordet. Nu lockas också stadsdelens yngre klientel av Bronx Beer Hall som tar upp en ansenlig plats mitt i marknaden. Jag beställer en bricka med charkuterier och låter bartendern guida mig genom utbudet av craft beer. Grimms Rainbow Dome, dry hopped sour ale brewed with apricot and conditioned on oak, blir en perfekt följeslagare samtidigt som jag pratar om Belmonts utveckling med Paul Ramirez som äger Bronx Beer Hall tillsammans med brorsan Anthony. Bronx Beer Hall är samtid och framtid, men man står med båda benen i den historiska myllan. Kontinuitet och förändring hand i hand. Och familjeband som är starka. När marknaden gör sig färdig för att stänga skruvas musiken upp i ölhallen och platserna fylls upp, marknaden förvandlas till tummelplats för studenter från Fordham University i närheten. Men ännu håller några handlare öppet och jag tar en sista lov genom lokalen. Banden med det förflutna är själva kittet som gör Belmont så unikt. 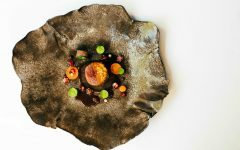 Här stannar restaurangerna och butikerna i samma familj i generationer. David Greco på Mike’s Deli lockar med de största delikatessbrickor jag sett och ett femtiotal olika mackor. På plats nummer fyra, första till vänster vid ingången till marknaden, en av de mest eftertraktade platserna, står Richard Liberato. Han driver Liberatores Garden som säljer växter och frön, precis som hans familj gjort sedan marknaden öppnade 1940. 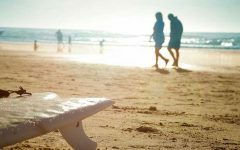 -My father came to the United States in 1936, he was actually born here but when he was a year old the family returned to Italy after the First War. When he was seventeen his father didn’t know what to do with him, you know he didn’t speak English and whatever. But somebody was selling there pushcart right here on Arthur Avenue. He bought it and he liked it, he liked doing it. When his mother came a couple of years later she didn’t want to be outside but he said they are gonna build an inside place. And in 1940 mayor Fiorello La Guardia built this market, he built the one underneath the metro north train on 116st street, he built one on Houston, on Essex Street and one in Brooklyn and the whole idea was to make the city a more cosmopolitan city. I La Guardias marknad fick 115 handelsmän plats och alla fick sju fot yta var. För att få plats i det lilla utrymmet gjorde vad det kände till, de gjorde en replica av en push cart och stod i mitten med alla varor runt omkring dem. Pappan stod där i mitten av sitt lilla bås tills han gick bort 2011, 92 år gammal. -Anledningen till att han fick stand nummer 4 var att han var amerikansk medborgare. Folk fattade ingenting, han kom ju precis hit från Europa, talade ingen engelska, visste inte ens var Connecticut låg. Men pappan stod här i sjuttiofem år, var inblandade i allt som hände i kvarteret och församlingen som var gigantisk med italiensk-amerikaner på den tiden med över 40 000 medlemmar, det fanns inte en förening som han inte satt i. När någon behövde hjälp fanns han där, berättar Richard och ögonen blänker till vid minnet. Med hjälp av sitt lilla marknadsstånd uppfostrade han fem barn och tog dem genom college. -He was a really good guy and you learned a lot from him. He was the real deal. He was the last of the pushcart guys. Precis så här ska en krispig italiensk pizza smaka. Mysiga valv och stenväggar som gör att man känner sig förflyttad till Italien. Emilias hemlagade husmanskost (Ravioli och cheesecake!) är vad som gör att det alltid hänger mycket lokalbor här. Crossover tapas, Spanish-italian and South American. Brygger sin egen öl dessutom. Joe owner, Regina (daughter) & Michael (son) is chef. Family owned business with lovely atmosphere. De italienska restaurangerna är många häruppe I Little Italy, Michelinlistade Robertos på Crescent Avenue är en av de bästa. Vinkällaren är fantastisk och vinlistan därefter. Lugna loja luncher eller mer mondäna middagar – välj själv. I hjärtat av Little Italy ligger den fina matmarknaden Arthur Avenue Retail Market. Botanisera bland delikatesser, köp med lite hem – och inte minst – passa på att provsmaka! Ingenstans hittar du så mycket bra italienska produkter som här. Provolone och gorgonzolaost, sopresatta-skinka och caprocollo-salami. Färsk pasta, tomater, vitlök och kryddor till tomatsåsen. The best spot in NYC for fresh pasta, which you can watch being made as you wait in line. Been serving the neighbourhood for more than eighty years. Bästa korven i NYC, vi skämtar inte. Det du inte hittar på Calabria Pork Store är inte värt att hitta. Sopressata, Culatello och en massa andra delikatesser hanger från taket. Ska du tillreda din egen pesto är det hit du ska gå. Fantastiskt utbud av bra olivolja, korvar, kryddor och pasta. Craft Beer heaven in the middle of Arthur Avenue Retail Market. En perfekt samlingsplats där kvarterets studenter hanger tills stängningsdags (ja Bronx Beer Hall har öppet även när resten av marknaden stängt). Suveränt utbud av svårfunnen öl som man med fördel kan matcha med enorma tallrikar med kallskuret från de italienska delikatessbutikerna intill. Vill man bo uppe i The Bronx ska man inte missa Opera House Hotel. Underbar byggnad i beaux art, fina rum och en sådär härlig stämning som bara historiska hotell kan ge. Dubbelrum från 1 300 kronor inklusive frukost. Vacker kyrka som fungerat som samlingsplats för generationer av famlijer. Underbara ornamenterade fönster och atmosfären gör ett besök hit till ett måste. Vill du fördjupa dig i det italiensk-amerikanska arvet och historien är det hit du ska gå. Alltid någon spännande utställning och en finfin botanisk trädgård. Bronx Zoo lockar horder av familjer alla dagar i veckan. Mängder med djur men också andra upplevelser som 4-d bio och en del åkattraktioner liksom ett häftigt monorail som tar besökaren genom vildmarken. Populära matningar av sjölejon och delfiner.